The location is brilliant. Close to Etihad Stadium for the football and events, also close to free tram services to get into the City or shuttle bus to airport. 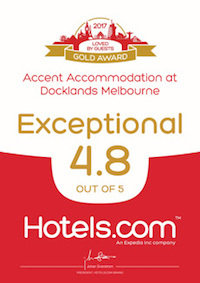 Love staying at Docklands and will defiantly be staying at Accent Accommodation from now on. Value for money and a great place to stay. You're not in the City but the free tram is outside your door. Excellent choice of restaurants and Harbour Town Outlet stores are just a short walk away. The view from our room was amazing. I'd stay again. We stayed for 10 nights. Fantastic view to wake up to from an amazingly luxurious bed, quiet yet so close to CDB, it's on the free tram route, everything you need in a kitchen and a home. Best of all is the warm, friendly, efficient and kind Accent Accommodation team. Did I mention the free parking and wifi that came with this fantastic place? Stop deliberating. This is the one! Excellent location as we had booked a ride on the Melbourne Observation Wheel. The City is a free tram ride away and the view from the apartment was wonderful. We have stayed at many places and often it's the little things that are forgotten but everything was there. Clean and light, with use of gym and pool included. It was great to be close to all of the restaurants but still have the facilities to cook for ourselves. Awesome views. Modern, neat and roomy. I loved my stay. Comfortable beds and the host was extremely helpful. Would definitely come back and recommend it to anyone who loves 5 stars accommodation. Our allocated apartment was spacious and had a lovely view of harbour and also view of a lit up Melbourne Observation wheel. On Easter Sunday, colourful hot air ballons could be seen floating over the Melbourne Observation wheel from the bedroom windows. The kitchen is spacious and well set up with cookware and utensils. The family enjoyed spending time in the outdoor swimming pool. It is easy to catch free trams into the City from the apartment. The host was friendly and organized and even checked on the last day that we were okay with transport back to the airport. The location is amazing and the apartment is spacious. It was a really great stay and I'd absolutely stay here again. The beds were comfortable and the apartment had everything you needed. Great location. Clean and well presented accommodation with great outlook. Secure parking included was a benefit. Very easy professional engagement with the staff. Will definitely book again for the family when next in town. Thanks again. Amazing service here, great people that really went above and beyond, and the communication was outstanding. My apartment was spacious and modern, the rooms were excellent and adequately stocked, big bath tub, not a single fault. Cool views and stunning architecture surrounding this place, with convenience stores and restaurants right there.